EXECUTIVE ACCESS: Guests staying at this 360 Blue property have access to limited golf tee times at Shark's Tooth and Camp Creek Golf Courses, the tennis courts at Shark's Tooth Club and complimentary use of two kayaks or canoes for one hour per day, as well as 20% off stand up paddle boards at the WaterColor Boathouse. 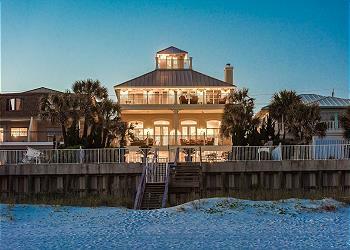 DETAILS: Unbeatable Gulf views greet you upon entering this Miramar Beach home. The first floor of “Beachfront Bliss” includes three guest bedrooms, a private theater with ultra comfortable seating, a wet bar and a pool table. The first two bedrooms on the ground floor feature plush king beds and private en suite bathrooms. Just outside, a terrace style deck awaits! This deck connects the indoor living space with the outdoor living space, private pool and sitting spa, personal beach access and, of course, incredible Gulf views. This floor is complete with a guest bedroom featuring a full over full bunk bed, ideal for kids or extra guests! Take the elevator or staircase to the second floor for even greater Gulf views and an additional outdoor living area with an awesome gas grill. This outdoor oasis is just off the incredible open living space inside that includes a dining room, gourmet kitchen, living room and separate wet bar. This floor also includes two guest bedrooms. One with two full over full bunk beds and the other with a king bed, personal porch and a private bathroom with a beautiful, modern shower. Two master suites are waiting for you on the third floor. Each of them boasts a king bed, breathtaking views and ensuites with a large tub and shower! This private master wing includes a wet bar with an ice maker, sink and beverage cooler. Two additional king bedrooms can be found on this floor, the first with a private bathroom and porch and the second with access to a convenient hall bathroom. Don’t miss the final bedroom tucked away on this floor featuring two full over full bunk beds. This bedroom has a private bathroom as well. Parties, weddings or events held at the property must be pre-approved in writing by 360 Blue. Otherwise, guests will be subject to HOA, Community and other associated fines. I’m so disappointed with 360 Blue. Our beautiful outdoor grill is just for looks. Good thing it looks great in our photos. Pool heater is not working so the 28 of us are just hanging out looking at our beautiful freezing cold pool. House is awesome though. Great Family Get Away!!! We are so sorry that your vacation was not as perfect as we would have hoped it would be! We know there were multiple inconveniences during your stay but we are glad to see that we were able to fix everything minus the pool heat on the same day it was reported and that the pool heat was fixed during your stay as well. We make every effort to check all of these things before our guests arrive and we do show everything was functioning correctly during our quality assurance check so we believe the issues happened after our check. Unfortunately, things like this do happen and we do our best to address everything as we are told. We hope you all enjoyed the bonfire we set up for your family! Thank you for your feedback, we hope you are able to visit the beach again soon! We had an amazing time at Beachfront Bliss. We had 23 people staying at the house, 7 total families. Our kids are all friends and adults too. There was so much for the kids to do, play pool, watch movies in the theater, swim in the pool, and enjoy the beach. Adults enjoyed the beach everyday as well. A great vacation overall. Will do it again! We are so thrilled that you all enjoyed this home and Miramar Beach for your vacation! We agree that there are so many wonderful things to enjoy about this home and having the beach right in your backyard makes everything perfect! Thank you for staying with 360 Blue, we cannot wait to see you all again soon! We had a group trip with about 18 guests and cannot speak highly enough about 1) the rental unit itself, 2) the 360 staff, and 3) the maintenance staff and their assistance. We all had such a great time because the unit is amazing - the location is perfect, the pool setup, the kitchen, and the movie room are all top notch. The 360 staff was extremely helpful with checkin/checkout, and very accommodating in regard to our reservation being made at the last minute. Finally, we had a small hiccup with the hot tub and even over a holiday weekend, the 360 folks came out super quickly to help get us back on track with the hot tub function. Overall, a really amazing trip. Thanks guys! We could not be more excited to hear how much you enjoyed your stay with us in Miramar Beach as well as your experience with 360 Blue! We are glad to hear that the small issues experienced during your stay were taken care of in a timely manner. Thank you for staying with 360 Blue, we hope to see you again soon! It was an amazing house, equipped with everything you could need! We had a blast! The beds and pillows were super comfortable. 360 Blue was really helpful and responsive to questions. The only suggestion would be to add a few hooks for towels in the bathrooms. Best vacation house ever. We didn't want to leave. 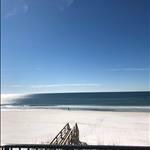 We could not be more excited to hear how much you enjoyed your vacation with us in Miramar Beach! We are also so glad that your experience with us at 360 Blue was a good one and we hope to be able to host you all for many years to come! Thank you for staying with 360 Blue! The property was as advertised. Very nice. We are so glad you enjoyed your stay with us! Thank you for staying with 360 Blue, we hope to see you again soon! Congratulations! We are so delighted to have been able to host you all for such a wonderful occasion! The photo you shared with us is priceless! We hope to be able to host you all again soon! This house is absolutely AMAZING!!! We could not have asked for better accommodations!! Not only is this house located right on the beach but it has swimming pool and hot tub (Beach chairs and umbrellas were set up each day for us to use). The high end appliances where exceptionally nice and the washer/dryer units located on the 1st and 3rd floor made it so convenient for all of us (not to mention the elevator to transport our luggage). And the kids loved the theater room and billiards table. For my husband and I, we loved the view from the master (Full sliding windows/door in both masters bedrooms upstairs) and the “man” grill outside was a bonus (its huge!). I want to compliment 360 Blue management as well. The app is so convenient and easy to use. All the information was at our fingertips and our check in and out was a breeze. If you are thinking about renting this beautiful home, you will NOT be disappointed. It is by far the best beach house we have ever stayed in!!! The house is very nice and our family enjoyed our stay. There are a few things we were disappointed with and one should be aware of. 1-the hot tub is not hot unless you pay an additional fee and this also heats the pool. 2-the door alarms malfunctioned and went off for over an hour -then was disabled which was very stressful with the children.3-you can not rent newly released movies and watch them in the theater room. This has been disabled. 4-.The beachfront is extremely crowded right in front of the house due to the adjacent public entrance walk way. Everyday our umbrellas and chairs were behind several tents and other umbrellas 7am. The condo next door had no tents -they all started right in front of this house. We would have to walk down the beach to find a spot and move the chairs & umbrellas. We are so glad you enjoyed the home but we are so sorry you had a less than stellar experience all around. We are pleased to see that our maintenance technicians were able to get out to you to address the pool alarm and get that corrected in a timely manner. In regards to the pool heating and movie choices, our homeowners have made that a rule that we must abide by. As far as the beach issue, if this would have been reported we would have gotten you in touch with the local Sheriff's office in order to have them removed as they are against county ordinance. We hope you are able to join us at the beach again soon! This house was perfect for our family of 20 - no small children - adults and young adults so the king rooms, pool, big kitchen and theater room were big hits. 360 did a great job with the concierge items we added as well as additional requests during our stay. We could not be happier to hear how wonderful your vacation with us was! The photo you shared is priceless! We agree that this home is perfect for large families and is very accommodating. We hope to be able to host you and your family again soon! We had a great week at Beachfront Bliss! Right on the beach, didn\'t have to pack beach wagons or even umbrellas thanks to 360Blue for providing 2 sets of beach umbrellas and chairs. We had 16 people in our group and it was a struggle to get everyone to leave on checkout morning. The home is so close to a grocery store that we used our 360 Blue provided bikes to access the store on multiple occasions. The 360 Blue staff was there for us for anything we needed, can\'t say enough great things about the staff. The best part is you wake up every morning RIGHT ON THE BEACH! Will definitely be back! Thank you so much for choosing 360 Blue and for your kind words. We are absolutely thrilled that you enjoyed your stay in this incredible home and we loved working with you while you were her. We look forward to seeing you back soon! The place was absolutely incredible. Brand new, beautifully furnished and very spacious. We had 15 guests and could have easily had 15 more. The pool, hot tub and theater room were all huge bonuses to our stay. Being right on the beach was wonderful. The 2 master bedrooms overlooking the ocean were breathtaking and the huge decks across the back were awesome. The kitchen had plenty of room and top end appliances everywhere. This house has it all! This is truly the perfect home for a relaxing beach getaway and we are so happy to you enjoyed everything that it has to offer. We loved having you with us and we hope to see you back soon! This house is amazing! We had 15 people, however it is so spacious that you had plenty of room to relax. Everything about this property is first class! The location on the beach, the proximity to stores, restaurants, and of course Starbucks. The pool and hot tub really added to the enjoyment. Our family can\'t wait to return! We are so happy to hear that you loved this amazing home as much as we do. Sounds like everyone had a truly remarkable getaway. We look forward to having you back soon! This house is amazing and ON THE BEACH. The private backyard with a pool and hot tub is on the beach. The house is Brand new, very beautiful and luxurious. This house should be in a magazine! We are so happy that you enjoyed your time in this amazing home. The location is truly second to none with all of the amenities you could ask for. We hope to see you back soon for another visit! Thank you for choosing 360 Blue for your spring getaway. We are thrilled that you enjoyed your stay and we look forward to seeing you back soon!